FlashNano, created in 2012, is an annual flash fiction challenge happening in November in solidarity with National Novel Writing Month. FlashNano participants are challenged to write 30 stories in 30 days, with prompts provided daily. We caught up with Nancy Stohlman to ask a few questions about FlashNano, its origins, challenges, successes, and her goals for the future of the project. Nancy Stohlman: Five years, huh? Nancy Stohlman: It’s hard to believe! NS: So how did FlashNano begin? NS: Truthfully when it started back in 2012 I didn’t have a long-term vision for the challenge. In fact, it was a casual conversation with fellow flasher Leah Rogin-Roper that started the idea – November was approaching, and while we both loved the novel-writing frenzy of Nanowrimo, we were both too immersed in writing flash fiction to switch gears and write a novel. I suggested we write a flash story every day as an alternative, and she said, “I’d do that if someone sent me a prompt every day.” And from those humble beginnings Flash Nano was born. That first year I posted a daily prompt on my Facebook wall, and by the end of the month I noticed there were a lot of writers playing along. The following year writers were asking me to do it again. Each year the challenge has attracted more participants; by 2016 I was emailing prompts to a list of over 200 participants as well as daily posting on Facebook, Twitter and my personal website. I also created a Facebook event page where participants can share their work if they want to. NS: How do you come up with your prompts? NS: I like a prompt that’s not overly prescribed, that has a lot of room for interpretation. If a prompt takes more than one sentence, it’s too long for me. A prompt like “Write a story where something turns brown” leaves lots of room for interpretation. I write each prompt from scratch when I wake up that morning. Sometimes the inspiration comes from something I read the day before or a dream I had or even the weather (“Write a story that takes place while it’s snowing”). November also has some holidays (in the US): Thanksgiving Day, Veterans Day, Columbus/Indigenous People’s Day and, this year, Election Day (“Write a story in the form of a speech”), so my prompts will reflect those moods as well. Since FlashNano draws writers from all over the world, the non-US participants are often patiently waiting for me to wake up (as it can be evening or even the next day for them). Sometimes people will (kindly) email me to see if I’m awake yet and ask where’s the prompt! NS: Do participants have to use the prompts? NS: You don’t have to use the prompts. You don’t even have to write one story a day. This is between you and your god. In general writers engage with the process in many different ways. Some like to post their stories every day (helps with accountability), other people will share sporadically and still others never share at all. This past year a group of writers made their own FlashNano support group. Another participant decided to write a haiku a day with the prompts. Others are attempting to link the stories. Not to mention there are an untold number of writers doing the challenge privately. I estimate last year had 400-600 participants but it could be many more. 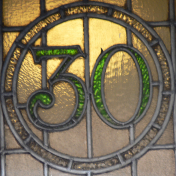 NS: Do you write 30 stories yourself in November? NS: Ironically, keeping the whole FlashNano machine running takes much of my creative juju in November, but I still usually manage to get out 5-10 stories. It’s not until December that I can go back and catch up. NS: How has FlashNano evolved in the last five years? NS: This past year (2016) was the first year that I started to see the project growing exponentially bigger, where people were using the term “FlashNano” without knowing me or the origins. This was also the first year that I started to wonder if this project would eventually become too big for me to handle alone. I guess this is a good problem! NS: What has surprised you about this project? NS: What continues to amaze me are the ripples that happen even when November is over. I regularly get follow-up emails throughout the year from writers telling me about publications and other successes they’ve had based on a story that was conceived during FlashNano. Lately I’ve had writers contacting me about larger projects they’ve started/completed actually linking all 30 stories and asking how they should credit me and Flashnano (in the acknowledgements is great unless you are including the actual prompts—then my name and website please!). And I receive many, many thank yous, which I really appreciate. I even had one writer create her own prompt delivery service after she missed the daily inspiration of November! NS: Where can someone find past FlashNano prompts? NS: You can find last year’s prompts on my website, but I only keep up one year. I’m compiling the archives for a future project. NS: Why and how can someone participate in FlashNano 2017? NS: The “how” is easy: Just decide to join us. If you want to “officially” sign up for email prompts, you can do that by visiting the FlashNano page on my website. Why should you participate? Because ultimately it’s fun. And just as Nanowrimo does a great job of getting people away from their inner critic and writing lots of uncensored material, so does FlashNano. There are always writers that beat themselves up as soon as they “miss” one day. For me, this challenge has no losers. I say if you write even one story that you wouldn’t have written in the month of November, that’s a win. NS: Any advice for FlashNano participants? NS: Yes: Don’t be in a rush to publish those stories. Even if they could be accepted as is, I think all stories deserve time to marinate and go through the magical puberty of revision. Don’t cheat your work of this step. In fact, I will plug my two upcoming workshops: For those who love the generative nature of FlashNano, I will be running my Writing Flash Fiction workshop in March, which is a class good for veterans and beginners alike who want to create more material. Nancy Stohlman talks to herself in Denver, CO, where she is a professor of creative writing and journalism and runs the Fbomb Flash Fiction reading series (fbombdenver.com). Her books include The Vixen Scream and Other Bible Stories, The Monster Opera and Searching for Suzi: a flash novel. When she’s not writing she sings lounge music on top of a piano. Find out more about her and FlashNano at www.nancystohlman.com.